If you like being on trend or, better yet, a trendsetter in everything you do, then you should check out this round up of futuristic tents. These tents will take your camping holiday to the next level. Camping gear doesn’t have to be just practical; it’s possible to be innovative, forward thinking and just plain cool as well. Always wanted to sleep amongst the trees? Or perhaps on a boat? What about the fastest set up ever? You’ll find all of these options in our list of cool camping gear. Inspired by Polynesian canoes, this one-person kayak transforms to a place to rest your head in the evening. The Kahuna Outrigger Tent would be perfect for a kayaking trip where you can simply pull the boat ashore and quickly put together your bed for the evening. During the day, this one-person is a perfect way to cruise around the water, using an oar and a foot pedal mechanism. There also is a folding chair in the main compartment where you sit. It provides a high back for more comfort for longer trips and a way to create resistance as you use the Mirage Drive pedal system. When you’re ready to sleep, you can remove the chair (and use it to hang out in the evening!). A screen cloth mounts between the outriggers and serves as a hammock-style bed for the tent. Unfortunately, you can’t order this example of cool camping gear (yet), it was a thesis project for two industrial design students. If you love a good hammock and get a little squeamish thinking about the insects on the ground when you camp, then look no further than the Tentsile Tree Tents for the latest outdoor gear. This treehouse-like tent called the ‘Stingray’ requires three support ‘beams’—most likely trees, but it could also be trucks, columns, etc. 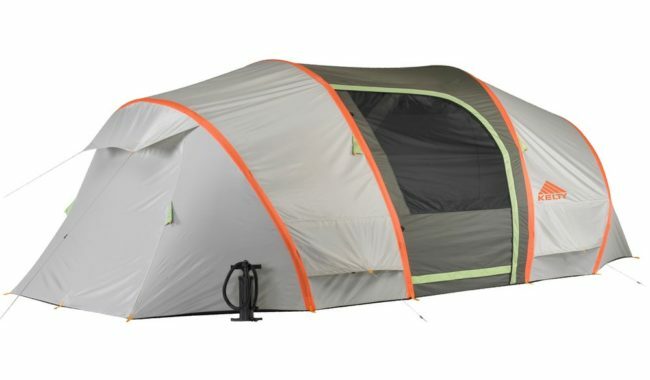 It can fit up to three people in the tent and is covered in a rip-resistant mesh to keep away the insects. It also comes with a flysheet to protect against rain. A cool element is the middle of the tent which opens up to allow you to either get in and out, or, if you are up high enough (and who wouldn’t want to be so you can have amazing views?) you can attach a rope ladder. Another fun addition to this tent is that you can have more people sleep under it by placing hammocks under the original tent and attaching them to the corner D-rings. (The company conveniently sells hammocks just for this purpose for $250 a piece.) You can purchase the original Stingray tent for $675. For someone looking for an easy tent to set up or perhaps someone who doesn’t camp a lot, then you might check out the 2Seconds Tent. After undoing a few clips, the tent sets up in just seconds. In fact, some of the reviewers commented on how they were sipping a drink and relaxing while their friends were still unrolling their outdoor adventure gear. That’s how fast it sets up! Plus, reviewers also said that the tent is super waterproof—the tent has been tested at 200 mm of water per hour. The flysheet also protects from condensation and provides a sheltered entry. This tent sleeps one to three people, depending on what version you get, and folds up easily as well. The manufacturer only works with a British company, but check out Amazon and Gumtree as both had options for purchasing this time-saving tent. The Orange Solar Tent, a concept tent for Glastonbury music festival and an award winner in the Greener Gadgets competition, takes solar energy to the next level by harnessing it to power the tent itself. Kaleidoscope and Orange Communication worked together to create this amazing example of cool camping gear that is made up of coated solar threads and traditional fabric so you wouldn’t need to add on solar panels. Also, three solar moveable solar panels outside the tent maximise solar collection and efficiency. Inside the tent, you can sleep up to four adults and features include: a wireless LED touchscreen that keeps tabs on how much energy is being used and generated as well as giving out a signal for wireless Internet access. Two other cool elements to this tent: 1) a heating system embedded into the tent’s floor that provides warmth once the temperature falls below the set number and 2) a glow-in-the-dark feature that can be turned on remotely via text. This super cool tent is still only in concept, but a Kickstarter campaign is supposed to happen this year. This tent removes the need to turn headlamps, drain the batteries of your flashlight or turn on your iPhone’s flashlight. A string of LED lights is integrated into the seam of the tent’s top, providing enough light to play cards, read, search for something in your pack or whatever else you might need to do. You can easily turn it on and off and even set it to 50% brightness from a push button, and you just need three AAA batteries to use the mtnGLO® light controller. The bonus for this one is that the tent is also lightweight, perfect for almost any season (not any harsh winters), and it sleeps two people. Retails for $699, but is sometimes on sale. OK, so you can already be above ground with the tree tent above, but what about a hammock tent that fits two people? Hello, romantic camping weekend: Check. Plus, you don’t actually have to snuggle together in the middle all night, there are actually two independent hammock beds that allow you to well supported and comfortable. There is a breathable WeatherShield that zips over the mosquito netting to not only give you some additional warmth but also add privacy. In addition, the tent features a storage compartment where you can place your backpacks or other items overnight. Imagine you and your crew could have a little tent village that your car actually is part of when you go camping? If you are interested, look no further than the Logos Decagon. A 10-sided decagon is the base of this tent home, thus becoming like a living room or family room where everyone can gather. Five sides can connect to the other offshoots, which can lead to sleeping quarters, the car port area and even a large section that can fit a dining table within it. In order to get all the components, you can spend in the upwards of $3,500 and need to order overseas, but hey if you and your large family or group of friends always camp together, it could be an amazingly cool way to do it. For the most futuristic tent we could find, we give you one engineered by Massachusetts Institute of Technology engineers who created an inflatable tent for the moon. Yes, you read that right. The moon. These engineers designed a pod that would allow two people to stay for several days on the moon’s surface and give them time to do more involved research. This out-of-this-world camping gear concept would protect the astronauts from the sun and provide life support. The reflective exterior would keep both the astronauts and system from overheating while the interior would have areas for changing (to contain lunar dust), sleeping area and storage of oxygen, water and food. Solar energy would power the inflatable base for things such as climate control and battery charger. While this tent is still in development, perhaps someday astronauts and even regular people might be able to “camp” on the moon. Whether you own cool camping gear or just your average, ordinary tent, why not take your next camping trip in the Byron Bay area and stay at Broken Head Holiday Park? We offer large, well-maintained powered and unpowered campsites. Our beachfront surroundings and proximity to Byron Bay are just two reasons why you should stay at Broken Head for your next Byron Bay holiday, check out our blog posts for the activities you can do whilst staying at our holiday park.